Another night in the capital for Bono and co. Hitting back at anyone who criticized the unconventional release of their latest album, U2 have announced their fifth date at London's O2 Arena. Full tour dates and ticket details are below. Despite the huge amount of attention that Songs Of Innocence attracted - including criticism from everyone from Pink Floyd to Noel Gallagher - U2's capabalities as a truly stadium size rock band are not to be sniffed at. As such, even the worst concert poster of recent times [pictured above] couldn't stop the band announcing a fifth night at London's O2 Arena on 2 November. Tickets for the new London show are on sale at 9am on 6 February. Along with five nights in London, U2 will play two at Glasgow's SSE Hydro. For tickets and more information, click here. Writing at the end of last year, Bono declared "Our album was to be like a bottle of milk dropped at the door of anyone interested in music and iTunes. As I understand it, the journey from the front door to the fridge and into what to some people felt was their bowl of cereal has something to do with a switch called 'automatic download' — if you turn it on, you sign up for being pushed stuff. That's about it...no flagrant abuse of human rights, but very annoying to people who a) like being annoyed, and/or b) felt it was like someone robbing their phone in the pub and taking a couple of photos before leaving it back on the table... some kind of breach of privacy which was really not intended. I empathise with the b)'s, but for the a)'s I've started referring them to the philosopher Jimmy Kimmel." 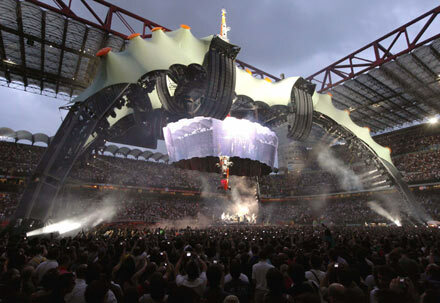 The massive claw that is the focal point of the 2009 360degrees World Tour. 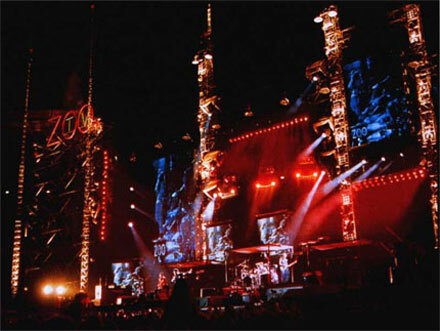 Three different claw stage structures, which each costing between Â£15 million and Â£20 million, are being used by the band around the globe. 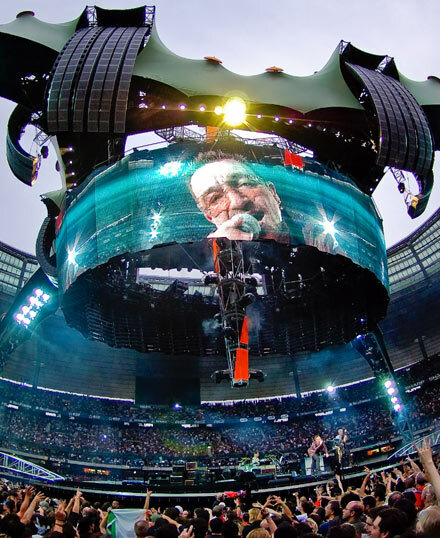 Bono magnified on the surround screen on the claw at the San Siro Stadium in Italy. The singer has enthused that the in-the-round set-up allows the band to get closer to the crowd and also get more people into the stadia. 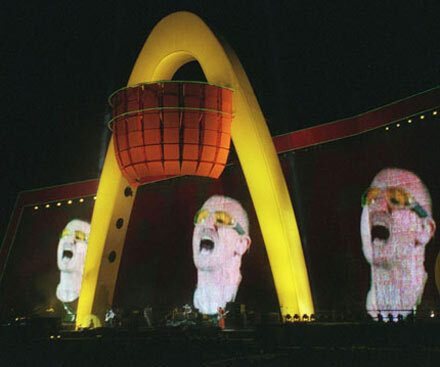 U2's Zoo TV Tour of 1992-93 featured hundreds of video screens, upside-down cars and array of other bewildering features - extravagant is an understatement. 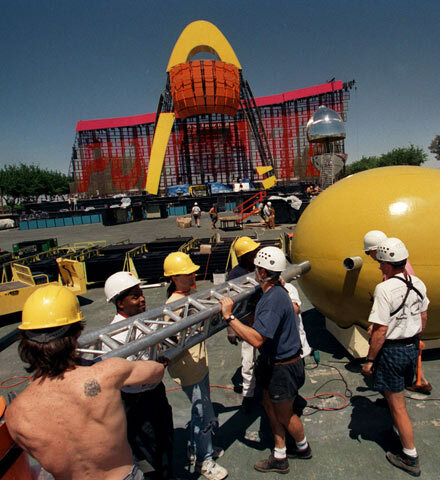 In 1997 the band headed out on the ambitious PopMart tour, one that dwarfed the Zoo TV Tour four years previous. A 100ft tall golden arch, a 150ft video screen and a giant rotating lemon were just some of the features of the gargantuan stage set-up. 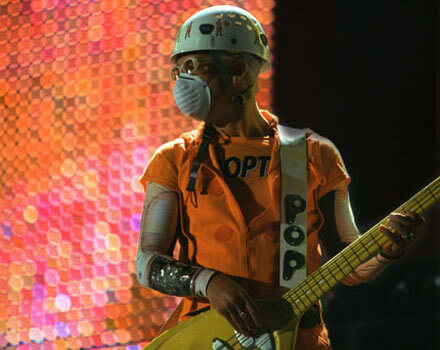 Adam Clayton's signature orange boiler suit and mask combo on the PopMart tour. Stage hands start work the lengthy preparations for the PopMart tour. 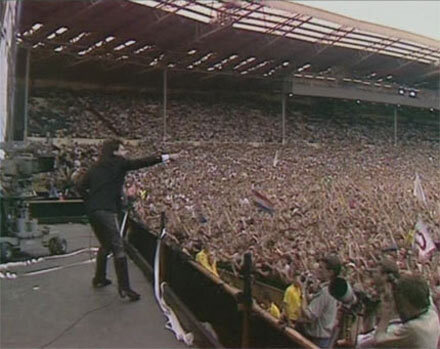 Bono reaching out to the crowd at the Live Aid concert at Wembley Stadium on July 13, 1985. 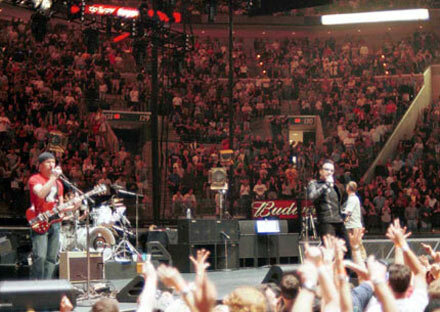 One of the defining performances of the historic day, U2 performed two songs, 'Sunday Bloody Sunday' and 'Bad' â€“ the later of which was interspersed with snippets of 'Satellite Of Love', 'Ruby Tuesday', 'Sympathy For The Devil' and 'Walk On The Wild Side'. Live on the Elevation tour in 2001 supporting 'All That You Can't Leave Behind'. A break from the norm, the band returned to arenas instead of stadiums for the first time in years. As a result, the stage set was less elaborate than fans have come to expect. 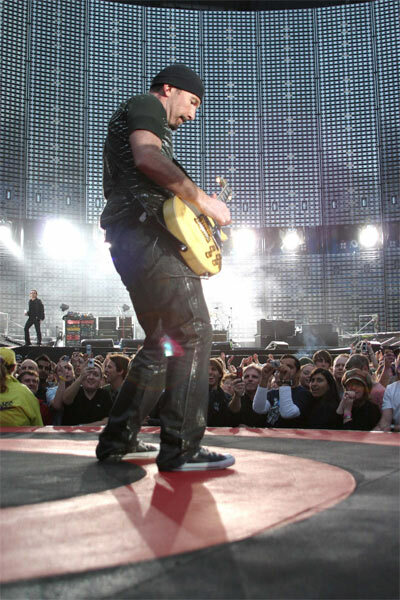 The Edge gets close to the crowd on the 2005 Vertigo Tour in Manchester. The stage set-up was designed by architect Mark Fisher and featured an ellipse shaped ramp which allowed the band to walk into the crowd. Lucky VIPs could even get inside the ellipse â€“ an area dubbed 'The Bomb Shelter'. 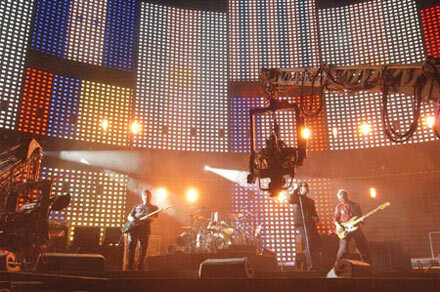 U2 in front of the huge backdrop used on the 2005/2006 'Vertigo' tour. 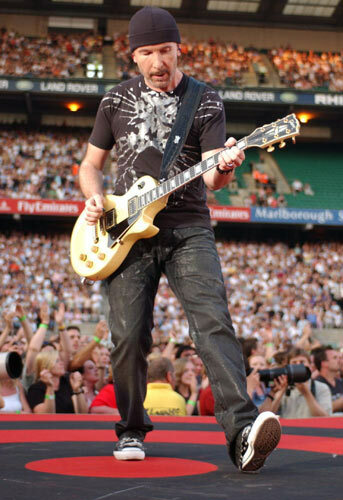 The Edge strutting his stuff on the Vertigo Tour at Twickenham Stadium, West London in 2006. 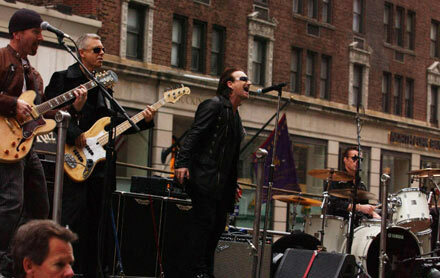 A more unusual setting for a U2 show â€“ on the back of a truck promoting 'How To Dismantle An Atomic Bomb' in 2004. 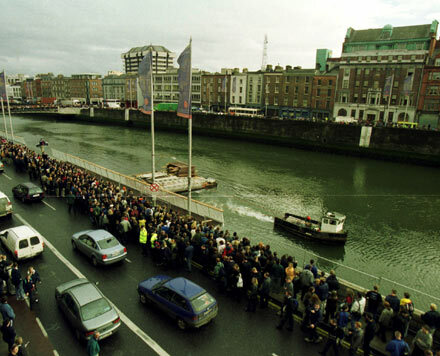 An ingenious album publicity stunt, crowds pack both sides of the River Liffy in Dublin to catch a glimpse of U2 performing on top of the Clarence Hotel in September 2001. 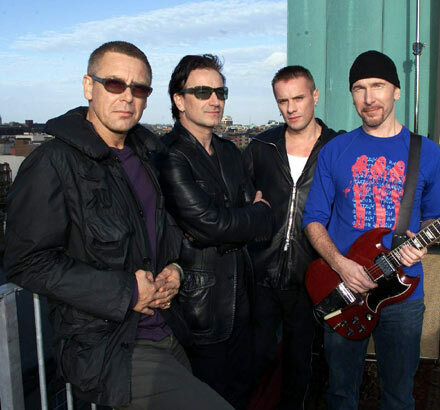 U2 on top of their self-owned Clarence Hotel waiting to perform live. The short set was broadcast on Top of the Pops on the BBC. 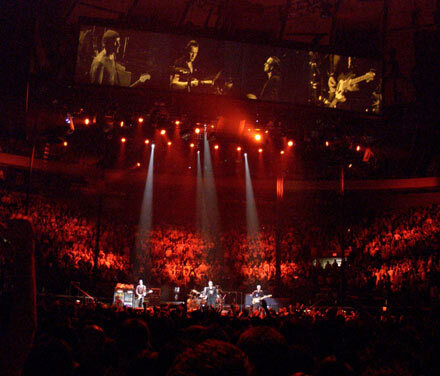 Madison Square Garden in New York on the Vertigo Tour. The stage was scaled down for the arena leg of the jaunt in keeping with the more intimate shows.